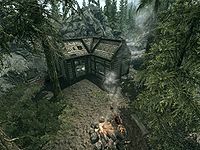 Hunter's Rest is a shack in the hills near Moss Mother Cavern inhabited by two Elk hunters. The building is a one room shelter, which is home to two hunters that poach game in the surrounding area and sell the various meats and pelts. 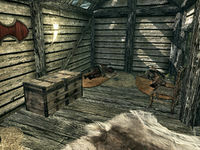 This homey little camp offers some nice respites to weary adventurers. The hunters who live here sell various meats and pelts. Outside is a cooking spit hanging over a campfire. There are many joints of raw venison both outside and inside the shack; taking any of these is considered stealing. There is an elk carcass on a table against the west wall of the shack that you can freely harvest for its hide and meat and possibly either small or large antlers. Beside the table is a tanning rack. A wood chopping block can be found on the east side of the house. Inside the house, there is a taproot behind the keg on the table. To the right of the table along the north wall are a row of three empty weapon racks. There are two bedrolls on the floor to the south, with a copy of the Archery skill book Father Of The Niben between them. There is an unlocked chest against the east wall containing minor random loot. Beside the chest is a food barrel and above the chest, on the wall, is a weapon plaque. This page was last modified on 8 November 2014, at 00:11.